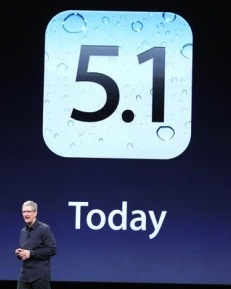 Along with the new iPad, iOS 5.1 was released today. It contains several improvements for iOS 5, including battery bug fixes, and Siri support for Japanese. iOS 5.1 has been in beta for a couple months now, so it's no surprise that Apple released iOS 5.1 with the new iPad. This is a milestone update, because it is the first update that iOS users can receive "over the air". iOS 5.1 will not require a computer to install, unlike all previous updates.